This is the Pennybacker Bridge, locally known as the Loop 360 Bridge (since Loop 360 is the road you see there) that sits in west Austin about 20 minutes or so from downtown. 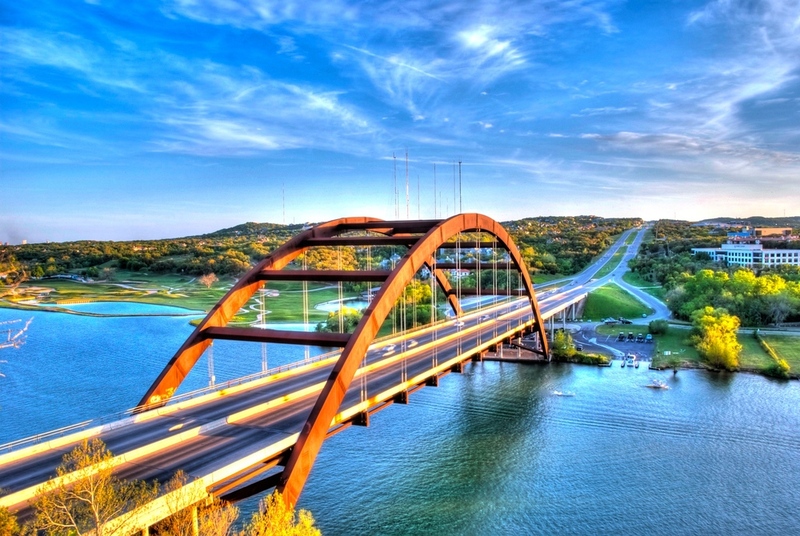 It is one of the more well known landmarks in Austin and is frequently seen in pictures, postcards and other renderings that represent Austin. It's a great bridge. I have driven over it for years and have always liked it, and being into photography has only increased my fondness for it. I find it very photogenic and have taken many shots from various angles. The rusty bridge looks good against the cool blue-green water and I like the dramatic high arch of the structure. In the distance (way back and to the left) you can see part of downtown Austin. This HDR image was taken from a nice vantage point on some rocks just above it. It is a popular place to watch a sunset and of course us photogs like it a bunch too!